Fall is one of the best seasons to explore the great outdoors near our Healdsburg wine country retreat. And October is your chance to see spectacular fall foliage across famous Sonoma County. 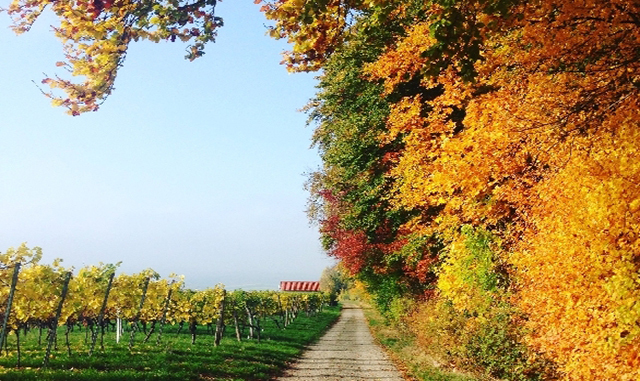 Nothing beats a fall getaway where you can sip world-class wines and see the wonderful leaves up close. During your fall weekend trip, you can visit dozens of tasting rooms just minutes from our hotel and enjoy a drive through stunning wine country scenery. Fall is harvest season and you can stop at a pumpkin patch or pick up a bag of freshly-picked apples. Here are a few more ideas for things to do in Healdsburg to get inspired for a leaf peeping adventure. Located just a five-minute ride from our boutique hotel, this lovely nature park offers some of the best foliage in Healdsburg. Spend an afternoon exploring this outdoor recreation area with over 155 acres and three miles of hiking trails. You'll walk through oak woodlands and enjoy beautiful views of Fitch Mountain, the Mayacama Mountains, and the Russian River. Seeing foliage from your perch on a bicycle is a fantastic way to experience fall in Healdsburg. There are dozens of trails to ride on from paved lanes through Downtown Healdsburg to mountain biking paths through the back country. You can rent a two-wheeler at Wine Country Bikes less than 10 minutes from Dry Creek Inn. Choose from hybrid bikes to explore the vineyards or a road bike for a long-distance tour through the countryside.